One of the greatest challenges companies face is storing and managing unstructured content. 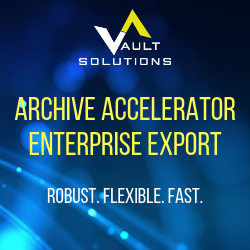 Archive Accelerator Export gives companies the ability to conduct fast, highly robust mass exports of data from Veritas Enterprise Vault™ - all managed via a simple management console interface. Our Enterprise Vault Export offering provides the ability to conduct fast, highly robust mass export of data from Enterprise Vault. Information can be exported for third-party analysis, taken offline for long-term archival, preserved in a non-proprietary format, or migrated to a separate archive. Data is exported along with key attributes and then stored in XML format. A multi-threaded process, export can scale to support billions of unique items. Archive Accelerator Export has the ability to export just the metadata to either a file system or a database for use in other business applications.